Ryder System, Inc. (NYSE: R), a leader in commercial fleet management, dedicated transportation, and supply chain solutions, announced that Shell Oil Company – one of America’s leading oil and natural gas producers, gasoline and natural gas marketers, and petrochemical manufacturers – signed an agreement for 15 liquefied natural gas (LNG) heavy-duty vehicles supporting oil and gas logistics operations in Lafayette, La. and Houston, Texas. Shell has relied on Ryder for logistics solutions for more than 10 years. As Shell's logistics provider, Ryder currently manages road transportation for Shell’s freight hauling activities across its U.S. exploration and production (E&P) activities, including a dedicated fleet that directly supports its Gulf of Mexico operations. 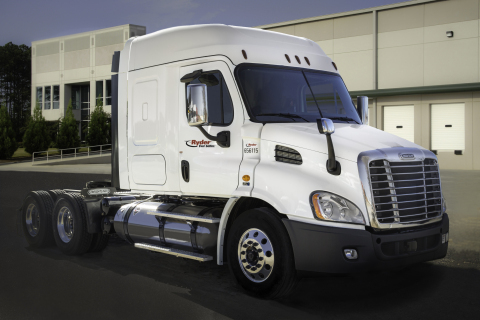 The new 15 LNG fueled vehicles will replace Ryder diesel-powered vehicles in the existing fleet and will be serviced out of Ryder’s Lafayette, La. facility, which is being engineered to meet the unique compliance requirements for natural gas. As part of this initiative, Ryder has signed a five-year fuel agreement with Shell which will provide LNG fuel for the dedicated natural gas fleet. The Shell sea port and cross state routes are an application ideally suited for natural gas vehicles. Ryder worked with Shell to develop a customized truck specification that was weight-sensitive to maximize freight revenue, while assuring durability and operability in the field. Ryder Dedicated Transportation Solutions provides companies with vehicles, maintenance, drivers, management and other value-added services. The oil and gas industry relies on Ryder to take costs and risks out of transportation and logistics, enabling customers to maximize uptime, keep supplies and goods moving, and bring costs down. This is all supported by a proven health and safety culture driven by experienced oilfield operators and health, safety, and environmental professionals. With more than 200 customers in the oil and gas sector, Ryder is at the forefront of change as the industry finds new ways to streamline and optimize fleets and supply chains. Ryder is the leader in natural gas vehicle solutions for the commercial transportation industry, with more than 50 million miles of experience, 18 natural gas vehicle maintenance facilities, and more than 6,000 natural gas vehicle trained maintenance and support personnel. Ryder has deployed CNG and Liquefied Natural Gas (LNG) vehicles into the fleets of Ryder customers in Arizona, Arkansas, California, Florida, Georgia, Louisiana, Maryland, Michigan, New York, Texas, Utah, Wisconsin, and Quebec, Canada. The Company operates Liquefied to Compressed Natural Gas (LCNG) fuel stations at its Fontana and Orange, Calif., service locations. The natural gas vehicles are being made available through Ryder’s participation in the Texas Natural Gas Vehicle Grant Program (TNGVGP), funded by the Texas Emissions Reduction Plan (TERP) initiatives and administered by the Texas Commission on Environmental Quality (TCEQ). For more information about Ryder’s natural gas vehicle solutions visit http://www.ryder.com/en/solutions/alternative-fuels-solutions/natural-gas-solutions.aspx. Ryder is a FORTUNE 500® commercial fleet management, dedicated transportation, and supply chain solutions company. Ryder’s stock (NYSE:R) is a component of the Dow Jones Transportation Average and the Standard & Poor’s 500 Index. The Company has been named among FORTUNE’s World’s Most Admired Companies, and has been recognized for its industry-leading practices in third-party logistics, environmentally-friendly fleet and supply chain solutions, and world-class safety and security programs. Inbound Logistics magazine has included Ryder in its “Green Partners” listing for five years in a row. Ryder was also recognized by the U.S. Environmental Protection Agency (EPA) with a 2014 SmartWay Affiliate Challenge award and SmartWay Excellence Awards in 2014 and 2013. Ryder is a charter member of the NGV Fleet Forum and a member of the Department of Energy’s National Clean Fleets partnership. Ryder is also a recipient of the 2011 NGV Achievement Award. A member of the American Red Cross Disaster Responder Program, Ryder is proud to support national and local disaster preparedness and response efforts. For more information, visit www.ryder.com, and follow us on our Online Newsroom, Facebook, LinkedIn, Twitter, and YouTube. Shell Oil Company is an affiliate of the Royal Dutch Shell plc, a global group of energy and petrochemical companies with 93,000 employees in more than 90 countries. We deliver a diverse range of energy solutions and petrochemicals to customers worldwide. These include transporting and trading oil and gas, marketing natural gas, producing and selling fuel for ships and planes, generating electricity and providing energy efficiency advice. We also produce and sell petrochemical building blocks to industrial customers globally, and we are investing in making renewable and lower-carbon energy sources competitive for large-scale use. In the U.S., we operate in 50 states and employ more than 20,000 people delivering energy in a responsible manner.